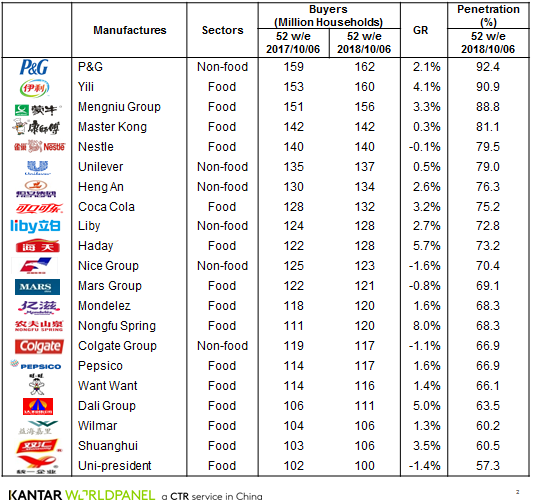 The latest data from Kantar Worldpanel shows that 21 fast-moving consumer goods (FMCG) companies reached over 100 million urban households during the 52 weeks ending October 5th 2018, with P&G and Yili being the first to hit the 160 million milestone. Those two companies reported 92.4% and 90.9% penetration respectively, enjoying the widest consumer base in China. In terms of growth rate, Nongfu Spring, Haday and Dali are top three performers, reporting over 5% increase in penetration year on year. "In a challenging environment for brands and retailers companies that constantly innovate and evolve within the new retail era are best placed to succeed” says Jason Yu, General Manager of Kantar Worldpanel Greater China. The biggest gains inside the top 21 and beyond have been made by those innovating in ways most relevant to today’s Chinese consumers, making their lives healthier, happier and easier. In the last 12 months, Chinese companies continued to outpace multinationals in recruiting new shoppers faster through braver innovations, agile go-to-market capabilities and successful activation of omnichannel strategy. Despite China's aging population, winning the love of millennial consumers is critical for brands to thrive. With more disposable income and need to express their individuality, young consumers offer great opportunities to unlock future growth. For the companies that grow penetration ahead of the market average, most of them saw noticeable advances in young families. For example, Nongfu Spring managed to grow its shopper base amongst young singles/couples by 30% in the last 12 months through its phenomenonal success of Victory vitamin water, which rode on the massive success of popular reality show ‘Idol Producer’. The company also launched the NFC juice brand 17.5° to cater to younger middle consumers’ aspiration for authenticity and freshness. Similarly, Coca Cola in China grew its penetration through smaller pack and new lines such as ‘Sprite Fiber Plus’ to balance young consumers’ needs for both nutrition and indulgence. Liby, an established player in the home cleaning sector, has actively used sponsorship and film stars to refresh its brand image and won 1.5 million young single/couple families. Almost one new product is launched every three minutes in China in 2017, and consumers in China are facing cluttered shelves with new products trying to grab their attention. However, only 6% of the new launches managed to bring incremental buyers. Brands that succeed in China’s formidably competitive marketplace will have to stand out by offering unique innovation and having go-to-market excellence. Dali, a well-entrenched food conglomerate, reported strong buyer gains in the latest year through its launch of Doubendou, a soy milk product riding on the concept of ‘natural and GMO bean free’. Backed up by Dali’s established distribution network to ensure its wide availability and in-store presence, Doubeidou was a blockbuster success and brought 13 million new buyers to Dali Group in the first year after it was introduced. 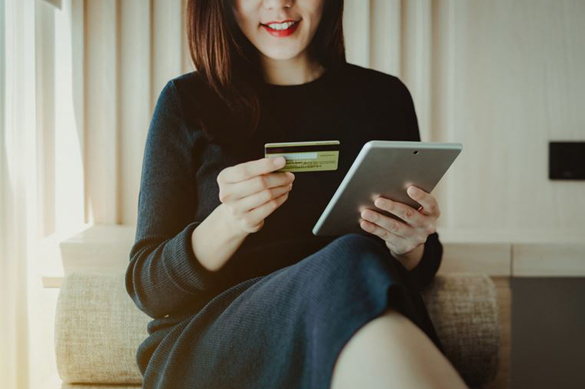 E-commerce has been a game changer in the last ten years in China, transforming the way brands connect to consumers. In the ‘New Retail era’, brands will have to adopt a holistic omnichannel view to win consumers at every possible touch point. 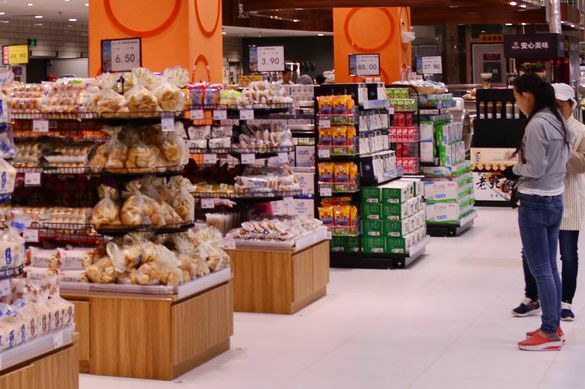 Offline stores, especially in lower tier cities, remain crucial to build trial and engagement through their interactions with millions of shoppers on daily basis. With the expansion in data integration and logistic capabilities, consumers are now able to choose multiple ways to shop and the boundary of online and offline channels are increasingly blurring. The latest Kantar Worldpanel data indicates that successful companies in growing shoppers are those who achieved a balanced penetration gain across both online and offline channels. Yili, as a leader in food & beverage, grew its online and offline buyers by 4 and 6 million respectively. 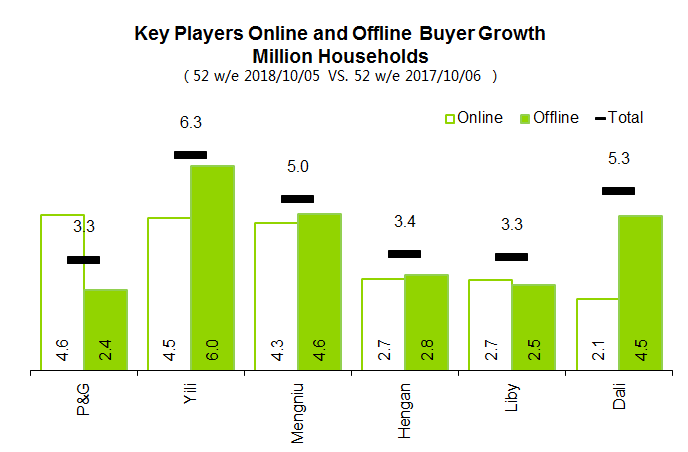 Offline distribution channels brought more shopper growth for companies like Mengniu, Hengan and Dali. Even for P&G, it managed to add 2.4 million incremental buyers through brick-and-mortar stores. Consequently, partnership with offline retailers remains essential for brands to keep up the omni-channel footprint. Kantar Worldpanel China continuously measures household purchases over 100 product categories including cosmetics, food and beverages and the toiletry/household sector. Its national urban panel covers 20 provinces and four municipality cities (Beijing, Tianjin, Shanghai and Chongqing). Mengniu includes Yashili,Biyou from Danone. Nestle includes Yinlu, Hsu Fu Ch and Totole. Mars includes Mars and Wrigley. Colgate includes Colgate and Darlie.